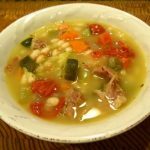 Navy Bean Vegetable Soup adds additional flavor with the addition of your favorite veggies, great home cooked meal & heaven in a bowl! Pick thru the beans, checking for small rocks, blemished beans, etc. Prepare the beans by following product directions by either soaking the beans overnight, or using the quick soak directions. Set aside. In a large stock pot, heat the olive oil over medium high heat. Add the vegetables to the pot; onion, carrots, celery, zucchini, tomatoes, corn & bell pepper to the pot, season with pepper & red pepper flakes & sauté until tender, 5-7 minutes. Add the bay leaves, ham bone & beans to the pot & add enough water to cover the beans and simmer covered for 1 1/2- 2 hours, stirring occasionally until the beans are tender. When the beans are tender, check the seasoning - if it needs salt add it now. Add in the lemon juice & parsley. The addition of lemon & parsley at the end brightens the flavor, don't skip this step!